Tubular nostrils are common to every procellariiform (member of the order Procellariiformes). In the albatross, the nostrils stick out from both sides of the bill. In the other three families, the nostrils sit at the base of the upper bill. Procel-lariiforms differ from other birds in that they have a highly developed sense of smell, which helps them locate food and breeding sites. Procellariiforms' bills are split into seven to nine horny plates, and the upper bill is hooked. This sharp hook, which is actually formed by a plate, allows the birds to hold onto slippery foods such as fish and squid. No other bird order has as large a size range as these seabirds. The storm-petrel weighs less than 1 ounce (20 grams) and has a wingspan of 12.5 inches (32 centimeters). The largest species, the albatross, can weigh more than 24 pounds (11 kilograms) and has wingspan of up to 12 feet (3.6 meters). Procellariiformes are covered in black, gray, brown, and white feathers. 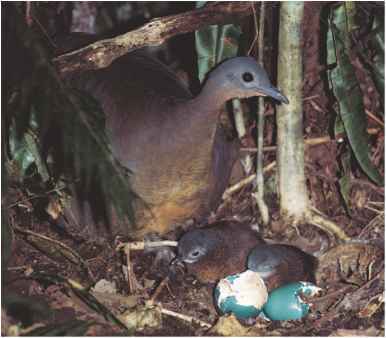 Most have black legs and feet, though the shearwaters' are blue. The bills are dark gray or black and often have a distinct yellow, orange, or pink coloration. Procellariiformes have oil in their stomachs that acts as a food source during the long periods between meals. In addition, the oil is used as a defense mechanism. When threatened, chicks and ground-nesting adults regurgitate (re-GER-jih-tate), bring up from the stomach, the oil and spray it over their predators. The oil cools to a waxy substance that damages the feathers of the enemy birds.